President Donald Trump condemned the massacre of at least 59 Las Vegas concert goers as an "act of pure evil" Monday, but refrained from addressing calls for gun control or the motives for the worst mass shooting in recent US history. 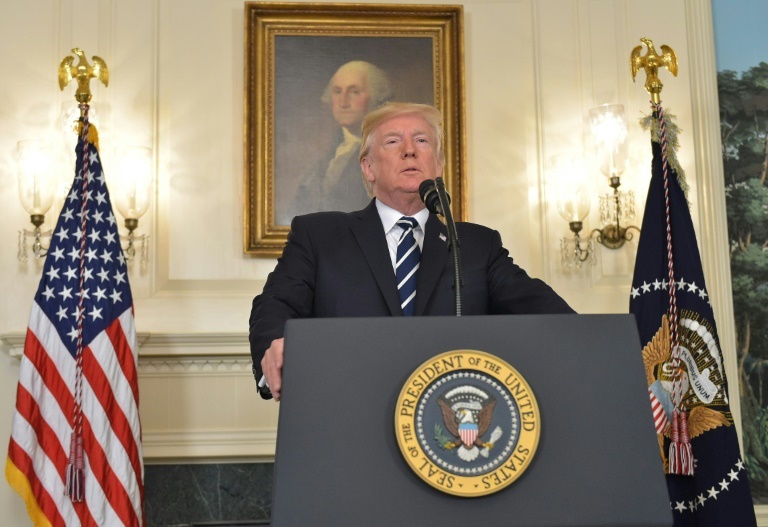 Delivering televised remarks, Trump tried to offer consolation and called for unity -- an act that has become a grim rite of passage for modern US presidents. Trump ordered that flags be flown at half-staff until sunset Friday, offered prayers for the victims and announced he would visit Las Vegas on Wednesday. Later, he led White House staff on the South Lawn for a moment of silence. Police have identified the gunman behind the Sunday night massacre -- which injured more than 500 people -- as a 64-year-old former accountant named Stephen Craig Paddock, who killed himself before a SWAT team breached his 32nd floor hotel room. Investigators recovered at least 16 guns, including assault rifles, from Paddock's room at the Mandalay Bay, and another 18 firearms along with bomb-making materials at one of his two homes. But in the immediate aftermath of the shooting, that unity was difficult to find. "The crowd fled at the sound of gunshots. Imagine the deaths if the shooter had a silencer," tweeted Clinton, whose Democratic Party has tried in vain to introduce lasting gun control measures. Gun violence accounts for more than 33,000 deaths each year in the United States, and according to the latest Gallup poll, 55 percent of American voters would like to see stricter rules for buying guns. But the issue is highly sensitive and Trump's own views have changed markedly over his years in public life. After the Sandy Hook Elementary School shooting, where 20 six and seven-year old children and six adults were mowed down by a disturbed 20-year-old, Trump appeared to favor stricter rules. Back then, his predecessor Obama -- who often called Sandy Hook the worst moment of his eight year presidency -- called for the deadlock to be broken and for Congress to act. But since then Trump -- whose White House bid was endorsed by the NRA -- has positioned himself as a defender of the constitutional "right to keep and bear arms." The NRA donated an estimated $30 million to Trump's campaign in 2016, according to the Center for Responsive Politics. US Senator Chris Murphy, who was the congressman for Sandy Hook, renewed a call for action in the wake of the Las Vegas attack. "This must stop. It is positively infuriating that my colleagues in Congress are so afraid of the gun industry that they pretend there aren't public policy responses to this epidemic," he said. 0 Response to "After Las Vegas massacre, Trump silent on gun control"